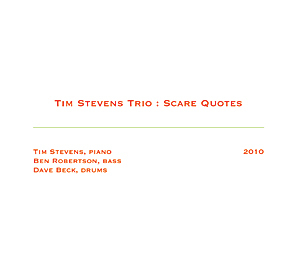 MOVING almost imperceptibly between the frisson of collective improvisations and the cues of composition, this fourth “white album” with Stevens on piano, Ben Robertson on bass and Dave Beck on drum kit is akin to the freedom of 2005’s Three Friends in Winter. Yet this outing, recorded in a day at ABC Studios, Southbank last year, is more compelling. Textures are tangible, timbres and tempos vary and the trio’s intuitive ability to build and sustain tension, focus and hold our attention never wavers. Whether from the gripping Wiseband and Huff, the delicate piano insistence and fine drum spatters of Dances With Jimmy or the bass melodies in Letters, Diaries, it is clear there is no need for scare quotes here. This review appeared in the Play liftout of Melbourne’s Sunday Herald Sun on April 10, 2011, under the name Graeme Hammond, but he cannot be held responsible. This entry was posted in CD REVIEWS and tagged Ben Robertson, CD review, CD reviews, Dave Beck, Lost and Found, Mike Nock, Scare Quotes, Three Friends in Winter, Tim Stevens. Bookmark the permalink. New album releases are always cool. You do expect to hear something different and this one seems to give you that as stated in the article. There seems to be an incredible jazz scene in Australia. Fantastic cd. Listening to it as I write. Tim Stevens has never done a bad one and in fact is getting better with each release. This is quite compelling. Well done! Thank god with EST now gone we still have Tim!